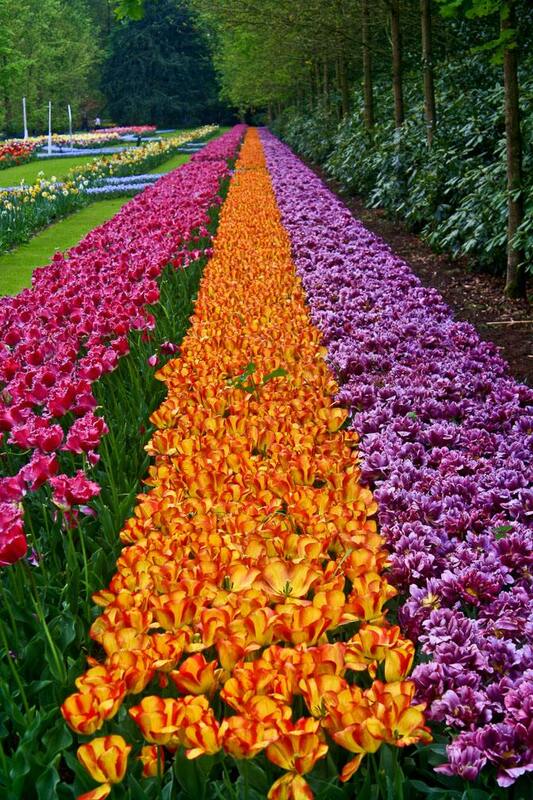 The depth and breadth of tulip varieties and colors at Keukenhof is astounding. 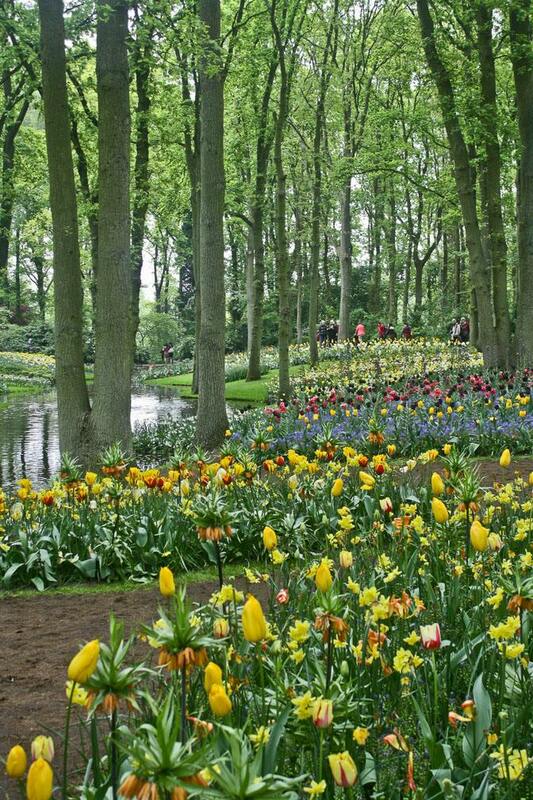 The heavily perfumed air wafted over me as soon as I stepped through the entrance gates of Keukenhof. The source? An enormous bed of purple hyacinths, just a handful of the more than seven million flowers, including 800 varieties of tulips, spread out over 79 acres of impeccably landscaped grounds. I had purposely planned to visit the Netherlands in the spring, when one of the country’s most iconic images, the lovely tulip, makes it annual appearance. Sure enough, this cheerful perennial showed up everywhere I went — in the parks in Amsterdam, the flowerboxes in Haarlem, the markets in Delft, and especially at Keukenhof, the second-largest garden in the world and the largest in Europe. It’s open only eight weeks per year, so I had to make sure the short window of opportunity didn’t close before I had experienced what it was about this fragile flower that drove an entire nation to levels of near insanity in the 1630s. Water features add to the tranquility of a stroll among seven million flowers. From my hotel in Amsterdam, I hopped on a tram to the gorgeous Centraal Station, where I took a train to Schiphol Airport, where I boarded a shuttle bus that transferred me to the entrance of Keukenhof in the town of Lisse, about 13 miles away. Although it seemed like a hassle to go look at some flowers, the effort was rewarded by one of the highlights of my two-week trip to the Netherlands. Keukenhof (“Kitchen Garden”) occupies the former hunting grounds of a 15th-century castle, part of which was used to raise herbs, vegetables, and fruit for the castle’s kitchen. It was created in 1949 when 20 flower bulb exporters, with the support of the mayor of Lisse, transformed the old estate grounds into a permanent exhibition of spring-flowering bulbs with the dual intent of inviting flower growers from across Europe to display their hybrids and of boosting Dutch exports. Opened the following year, the park became an immediate hit with the public, drawing in 236,000 visitors during its two-month season. Today, that number is edging toward one million. Mad for tulips: The Dutch went more than a little nutty for the flower 400 years ago. The second goal was apparently quite successful, too. 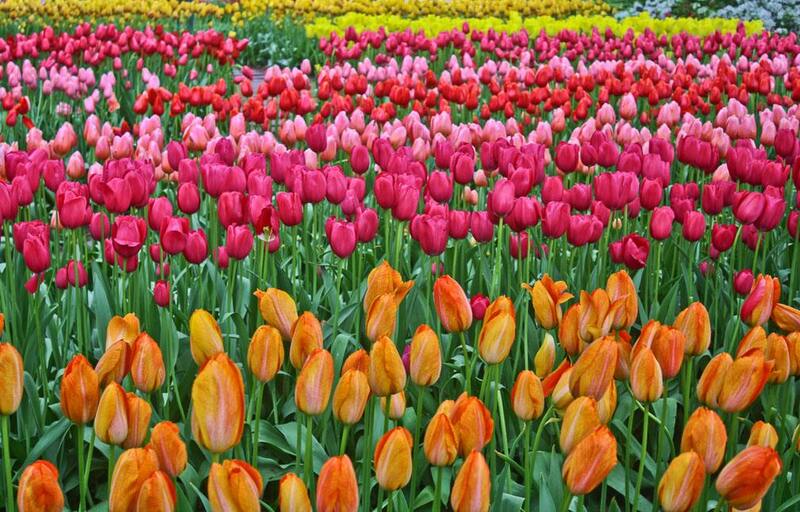 The Netherlands is the largest horticultural exporter in the world, shipping out about one billion tulip bulbs and cut flowers annually. That’s pretty impressive for a country where the tulip was a stranger until around 1570. 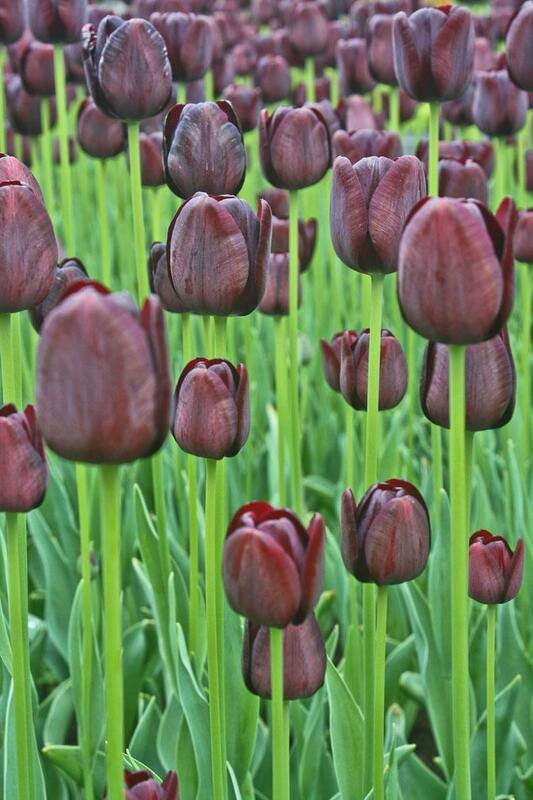 Native to Central Asia, the tulip was particularly prized in the Ottoman Empire. Even today, the tulip retains its place of honor in a streamlined design on the sides of the airplanes in the Turkish Airlines fleet. The flower eventually made its way to the Dutch Republic, where it quickly became a hugely coveted possession, an exotic import that captivated the richest merchants who were experiencing unprecedented wealth during the Dutch Golden Age. Acquiring bulbs from the Ottomans, the Dutch started cultivating their own tulips, and the trade in bulbs skyrocketed. The wild scramble to join in the rising hysteria was not limited to the rich, however; soon, it lured even lowly street traders, craftsmen, florists and regular workaday folk who were willing to risk everything in order to make a quick guilder or two — or several thousand. During the astronomical rise in prices and unbridled speculation that they would climb even higher, tulips were sometimes used as currency. At the height of the craze, in 1636–37, a single bulb of the Semper Augustus, an exceptionally rare red and white variegated tulip, cost more than the price of a grand canal house in Amsterdam. Another rare flower worth 3,000 guilders (10 times what a whole family could live on for an entire year) would cost, according to a pamphlet in 1636, the equivalent of eight pigs, four oxen, 12 sheep, 24 tons of wheat, 48 tons of rye, two large casks of wine, four barrels of beer, two tons of butter, 1,000 pounds of cheese, a silver drinking cup, a pack of clothes, a bed with mattress and bedding, and a ship. 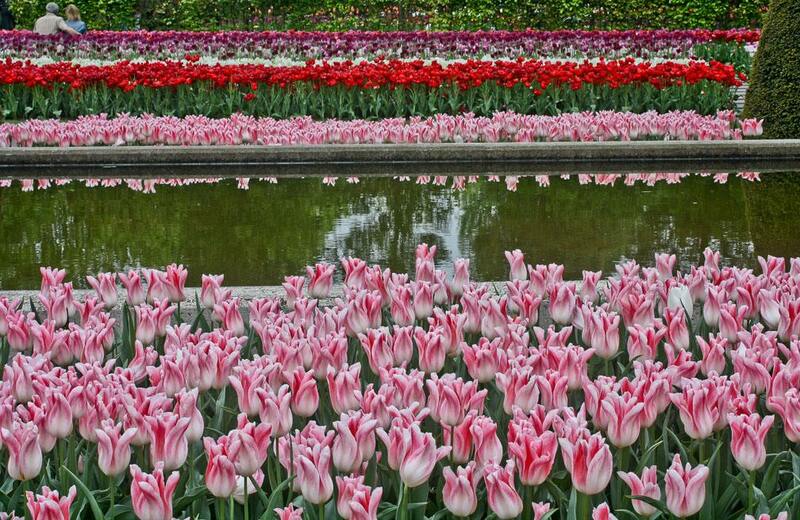 Like vibrant carpets, rows of tulips appear all over 79 acres of gorgeous grounds. As is usually the case in such booms, the inevitable bust followed. Traders began to question how much higher the prices could climb and suddenly adopted a more cautious approach — an abrupt reversal that resulted in disaster. When prices tumbled at an alarming rate, the market collapsed, hard and fast, in what is widely regarded as one of the world’s first stock market crashes, leaving countless people bankrupt and indebted for obscene amounts of money that they would never be able to repay. Judging by the number of people visiting Keukenhof, the Dutch are still mad for tulips, but in a much more rational way. The garden, now in full bloom, is an immensely popular place, crowded (but not oppressively so) with Dutch and foreigners alike who have come to appreciate the artistry of the landscapers and their delicate charges. In addition to the open fields of flowers, the designs for which change every year, they have carefully planned a variety of thematic gardens to inspire visitors to do some planting at home. For instance, the Amsterdam Garden, laid out along a canal, showed how to make the most efficient use of small plots, while the Insect Garden was devoted to plants that would best attract butterflies and bees. The Herb Garden, the most fragrant section, offered a celebration for my nose, with herbs, hyacinths, jonquil daffodils, and three particularly aromatic tulips jolting my olfactory senses into pure euphoria. Sinuous fields of hyacinths flow along sunny daffodils. Along the serpentine pathways throughout Keukenhof, straight, seemingly endless rows of tulips counterbalanced undulating waves of them and precise design patterns. Accustomed to the tulips with solid colors and bulbous forms at home, I was stunned by the many different varieties and colors I had never seen before. Tulips with flared or fringed petals, for instance, were entirely new to me, as were tulips that looked like peonies and the “Queen of the Night” tulip, with petals of violet so deep that they were almost black. The striped tulips were also a revelation — rose, yellow and white for one variety; orange and gold for another. I was beginning to understand why the Dutch went a little bonkers — and why they went so far as to design special Delftware tulip vases just to display these newfound treasures. Although clearly the star of the show, the tulip did not hold a monopoly. In a wooded area, tulips mingled with deep pink and light purple azaleas. 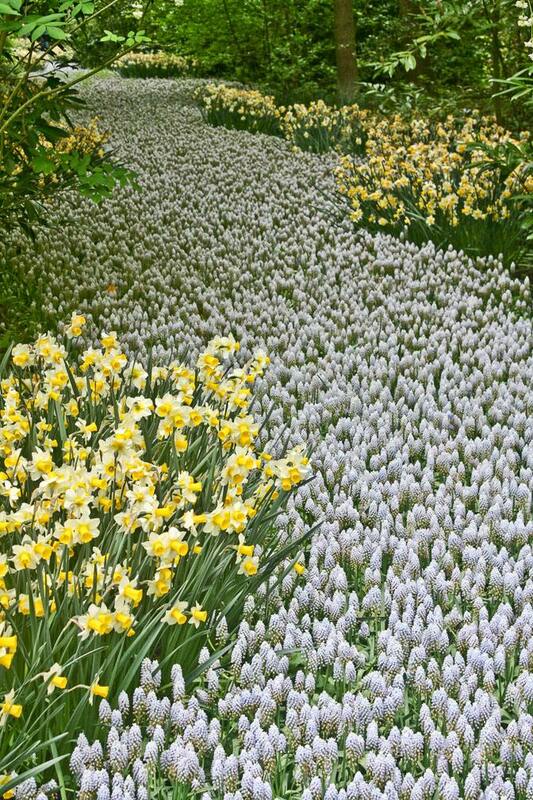 A river of white hyacinths flowed along shores of daffodils. Crocuses sprouted out of emptied cheese wheels and traditional wooden shoes. An occasional fern or Japanese maple grew beside one of the garden’s water features — a gentle waterfall, a little stream, or the largest body of water, a lake with a multi-pronged fountain, a lush island, and circular wooden water lilies floating at the edge that invite children and adults alike to hop frog-like from one to the next. Colors stand out even in the shade of the wooded areas. I found the hard-core floral enthusiasts congregating in the pavilions throughout the garden that provide both shelter during pop-up showers and a more close-up experience with flowers and the hundreds of growers who participate in the shows here. The Orange Nassau Pavilion, for instance, presents a rotating schedule of featured flowers, including roses, daffodils, chrysanthemums, and callas, that changes every week. The Beatrix Pavilion boasts tremendous displays of orchids, anthuriums, and bromelias, while the Willem-Alexander Pavilion closes the season with a bang when it empties out its 75,000 tulips and hosts the world’s largest lily show. By the time I left this gorgeous garden, thoroughly entertained and captivated by its beauty, I could almost understand how seductive the chance to make a fortune from a flower must have been four centuries ago, but I still couldn’t fully comprehend the madness of it all. Yet, when I returned home, I suddenly found myself with a bunch of tulips in a vase in my living room for the next couple of months. To visit Netherland in this season is a dream of my wife. Thanks, Victor. I hope you and your wife get there soon! Thank you, Bel. A really beautiful place!